Lets bring friends together, new and old, once a week for a Clan Fight Night. Open to all Squad Clans and existing special community members. Either on Wedneday or Sunday evening weekly at 2000 or 2100 GMT. This time should give some of the US clans a chance to particiate too. Time: 2040 GMT congregate / 2100 GMT game start. Start to meet at 2040, balance teams, decide which map is to be played. Game to start at 2100hrs. Teams can be composed in any way as long as numbers are balanced. Squads can be clan exclusive or all mixed up. One map played under match rules. Either AAS or Insurgency game mode. Each team plays both sides. Overall ticket win after two rounds. Five minute break in-between. The match rules are to provide structure and create a semi competitive atmosphere to carry the event as well as a managable duration. The main focus of the evening is to bring everyone together for a weekly meet and game. Also to integrate new clans and participants into the existing community. Stay familiar and friendly, communication open, information shared. And of course, the obligatory banter, shits an' giggles. Bring your full roster, send a few guys along, it doesn't matter. Let's get people together for a weekly semi competitive match in a BS free environment and watch the bullets fly. EXODUS are happy to hold the first event, and any others, but the idea would be to tour around a different clan server each week. Obviously this will take a little organisation between clan reps, we can create a steam and discord group to disperse information. Post up and express your interest. Ill let the 303RD know. Dunno my schedule for that night yet but im sure a few can show up! Yeah one or all. Might only be ten of us total first week battling over one flag in Sumari but its a start. It is holiday period and the eve of xmas eve afterall. It will grow with time. 2100 start should give all the Europeans a chance to eat their food and deal with family commitments and any Statesiders a chance to turn out too. Nothing is set in stone though and we can make it work any feasible way. Lets just get together for a fight and take it from there. Yeah one or all. Might only be ten of us total first week battling over one flag in Sumari but its a start. It is holiday period and the eve of xmas eve overall. But I'm sure it will grow with time. as we saw exemplified by the first Squad League matches, all it seems to take is somebody to throw out an idea, figure out a date and time, let people know and stick to it! We have a steam group set up for the event. Clan reps and interested parties drop me a PM with your steam name and I'll get you added. 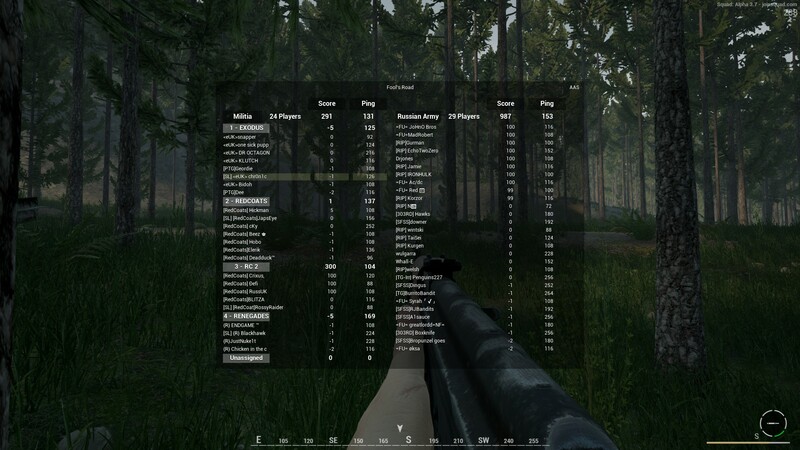 I am thinking we should make a central area for all community/platoon leaders so we can setup scenarios etc. Hostage/Convoy/etc etc then we can do huge group battles. Remember the old MFOTS days in BF1942 desert combat! Anyway hope to get a pm about this would be great. I'll see if I can let TG know of the event. Thanks for putting it on! Maybe you and Squad League can collaborate and get a system down! EDIT: At least a few will be out tomorrow! Look forward to playing with you all. Cool. Be nice to see the Tactical Gamer crew getting involved. The idea is to bring the closed alpha crew back together again and bring new clans into the community giving everyone a chance to get involved. We will be promoting Squad League on an ongoing basis, as new clans get involved we will point them in the direction of Rusty, DBM, and crew. The Art of Warfare [TAW] would also be interested. I will add you on Steam and forward the info to my EU and NA battalions. We got SFSS, 303rd, Redcoats, and EXODUS confirmed, with TG, TAW, PTG, AHC, RiP hopefully coming along too. Pass the information round as you bumb into people today. Drop me a PM with your steam detials and ill get you added to the steam group for the password. Squad SA's, Mods and Devs are ofcourse welcome too, perhaps you can band together and form a squad?. Password released via steam group at 2000 GMT. My steam is lovechiefs. With the holidays not many of my guys are available, but after the holidays, I will talk to the NA & EU battalions CO and we will go from there. Same, several out for the holidays. Those who can will come and it will be fun for all! It was fun night guys. Thanks for a game. Bummed I missed it, but family drove in for the holiday and I'll be taking a break from Squad until Sunday. Have a nice weekend/holiday everyone! Sadly had to miss this. Anything before 9pm during the week is a no go for me. Family comes first. Especially tonight. We had baking going on for presents. Big shout to all clans that showed up. Good to see everyone. We managed one full round on Fool's Road before we encountered some server issues. If anyone has streams / video post them up here if you like. Sorry if the password may have offended anyone. In the mean time if clans want to arrange scrims please go ahead. EXODUS for one would like some organised friendly battles to help us prepare for future squad league matches. Any suggestions on how we can improve things next time out please fire them forward.